The story of this costume began two years ago, four months before my son was even born. It was September 2015. I was at Retrocon in Oaks, PA with friends. I was four months pregnant and I just found out I was having a boy. There was a kids costume contest that day and I decided right then and there that I was going to enter my son into the contest when he was old enough. I'm a huge fan of Back to the Future and thought he would make an awesome Marty, even though I hadn't met him yet. I bought the first part of his costume, an orange puffer vest, when he was only two months old. I posted a photo of the puffer vest, laid out on his bouncer, on Facebook with the caption: "It starts..."
I put a lot of attention into the details of my son's "Mini Marty" costume. I scoured eBay and Amazon, for about six months, looking for the perfect jean jacket, jeans, burgundy tee shirt, black suspenders, black and white checked shirt, and mirrored aviator sunglasses. I purchased everything in 24 month size so that my son could wear it in the fall of 2017. I found the Nike sneakers online at Foot Locker in white and painted the swoosh, and other details, red. A lot of people use red puffer vests for their Marty McFly costumes, but that's the wrong color. The puffer vest that I bought for my son's Marty costume, when he was two months old, was a bright sunny orange. That's wrong, too. Marty's puffer vest is a deep, dark burnt orange. I bought a box of Red Rit dye, for synthetic materials, and dyed the vest, on the stove in a large stock pot, for about an hour, to get it the nice dark orange that it needed to be. I wasn't until this past September, when we were at an outdoor toy fair, that my son spotted a little boy in a Step-2 plastic ride-on push car. My son wanted the to ride in the car so badly that my husband and I decided to get him an early Christmas present. After we got the push car, it suddenly dawned on me that wouldn't it be awesome if I could turn this little plastic sports car into a DeLorean for my son to ride. I'm so glad I saved the box as that became the body which I molded into the body of the DeLorean. I spray painted the entire box silver on the outside and black on the inside. The logos, headlights, tail lights, hub caps, time circuits, and flux capacitor were found online and sized and or skewed to fit the scale of the kiddie car. They were then protected with clear contact paper and glued to cardboard. The OUTATIME license plate is a real aluminum bicycle-sized plate and came from eBay. The flux capacitor was placed in a clear plastic picture frame before taping it to a box wrapped in silver duct tape. Everything is put together with black and silver duct tape. The blue conduit lighting came from Amazon. It's two blue LED battery powered wires that I affixed to the DeLorean conduits with heavy duty clear plastic packaging tape. The lights have three flash settings to simulate time travel. A lot of research was put into the tiniest detail, almost as if I were making a Back to the Future time machine out of a real DeLorean. I stayed up until 2AM the night before Retrocon putting on the finishing touches. 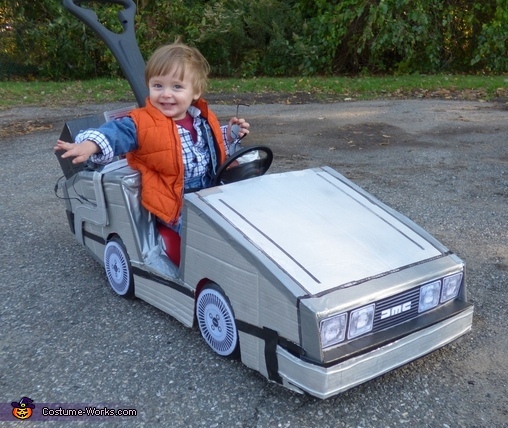 We entered Mini Marty into the Retrocon Kids' Costume contest this year and he won second place! The reactions were outstanding. Everybody loved Mini Marty in his DeLorean as we pushed our son around the Retrocon show floor and everyone wanted photos of him. He showed up on several cosplay sites after the con. I posted Mini Marty's photos on my Facebook page and one of my friends, who makes hand made Renfaire costumes for her whole family, shared a photo of our son in his costume with the comment, "We can all go home now, Suzanne Smiley wins at cosplay mommy." We got a lot of awesome reactions during Trick or Treat last night as well. Everybody recognized Marty and the time machine and the car's blue lighting looked awesome outside in the dark. One man said that Mini Marty "should win first place in EVERY contest!" Jonny!! OMG, the cutest ever!